Without a doubt, life, family, and religious freedom are under an unprecedented all-out assault in our nation. Many left-leaning states are following New York’s lead and further undermining the right to life. Others are embracing various aspects of the radical transgender agenda by forcing it on schools, businesses, and non-profit organizations. And, the fundamental building block of any successful society—the family—is under vicious attack from all fronts. Despite that reality, Congress is actually more pro-life, pro-family, and pro-religious freedom than ever before. Each year, FRC Action releases our congressional scorecard, grading members of Congress on how they vote on a number of bills, nominations, and resolutions related to our core issues of faith, family, and freedom. Members who score 100 percent are named our “True Blue” members and invited to receive an award at our annual reception on Capitol Hill. Our most recent scorecard included votes on the Pain Capable Unborn Child Protection Act, the Born-Alive Abortion Survivors Protection Act, judicial nominees, and Planned Parenthood, among others. This year, we set a record for the most True Blue members of Congress ever. A record 276 members of the House and the Senate received a True Blue award for their 100 percent rating on our congressional scorecard. That’s over half of Congress that stands 100 percent for life, family, and religious freedom! 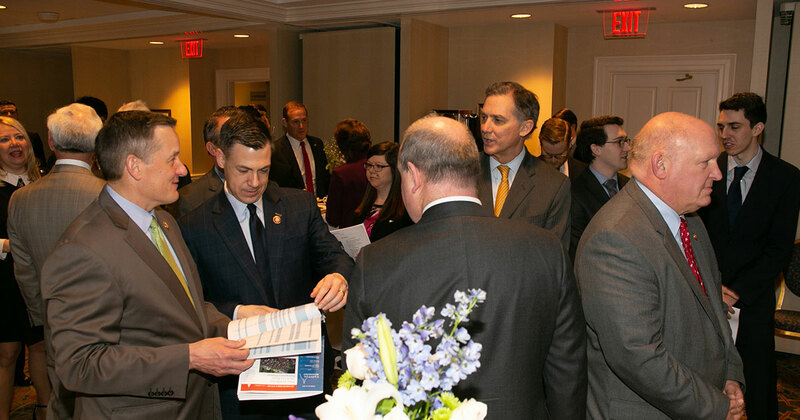 On February 28, many of these members joined us at the Capitol Hill Club in Washington, D.C. for our annual True Blue reception. Each member had the chance to receive an award and speak with our president, Tony Perkins. FRC Action staff also had the opportunity to talk to each member and thank them for standing with us on the foundational values of life, family, and religious freedom. At a time when life, family, and religious freedom are being ferociously attacked, it’s refreshing to see so many members of Congress who are 100 percent committed to standing with us and fighting every day for the unborn, the family, and the persecuted. This is further evidence that our election efforts each year are paying off! Check out our scorecard to see if your members of Congress support faith, family, and freedom. If not, contact them and tell them to start standing for our shared values right away. Also, check out our Twitter page to see what our True Blue members had to say about the work of FRC Action and about standing for life, family, and religious liberty at such an important time in our nation’s history.